"I have been passionate about woodwork all of my life yet it was never my profession. Wherever I went I always had my workshop and a reasonable collection of tools. I have taught woodwork in my spare time and raised a lot of money for charity through woodwork. Examples of my woodwork have been found in 10 Downing Street and many other capitals in Europe as gifts to politicians and friends during my time working for our government as a computer programmer, soldier & security analyst." In 2011, after retiring from his day job and after writing and publishing a bestselling book (the Stone Message - available on Amazon) Peter decided to follow his biggest passion, teaching woodworking. "I wanted to help other people progress with woodworking but rather than teaching to small classes I chose YouTube as it would provide a truly global reach. I created "The New Brit Workshop" as my YouTube channel and have uploaded over 300 videos. I have over 31,000 subscribers and can fill the Royal Albert Hall every day with the viewers to my channel with a monthly total of over 150,000 hits." "I have a "Golden Rule" which never has and never will be broken. I have to be happy to recommend a product, tool or technique to my very best friend in order to publish a video about it. If a product fails this test then there is no video. Many items have failed and some with famous names on the badge. Such items are returned to the sender and I go to some length to explain the problems that I would have encountered. 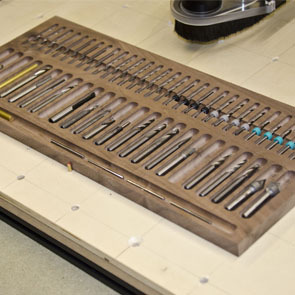 As a result, one major manufacturer redesigned a tool and withdrew the original from the market. Another household name withdrew an item from sale and recalled those sold after I discovered a safety issue." "In 2016 I was approached by a US company to make a series of videos about a small CNC which they had developed. I had not had any experience of CNC work before this. 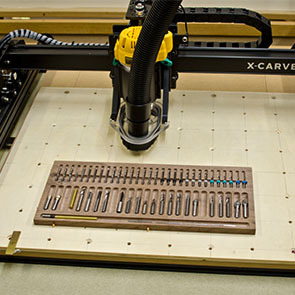 Inventables is the US company and their CNC is called the X-Carve. It is an ideal machine for a school or training establishment or the home user. I considered the X-Carve to be a popular CNC for first time users and wanted to try and help them make up their minds before purchase and guide them with the assembly and commissioning process. 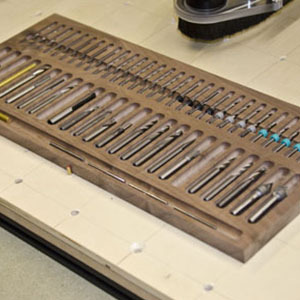 I also realised that the CNC is becoming a more popular tool, even in the home workshop, and so occasional videos about CNC work would be popular." For software I use VCarve Pro for the design and toolpath creation and then Universal G-Code Sender (UGCS) to send the toolpaths to the X-Carve. I did a Google search and examined all of the reviews and comments that I could find for a variety of software suites. There were some free ones amongst the list. It was quite clear to me that VCarve Pro was popular and user friendly." 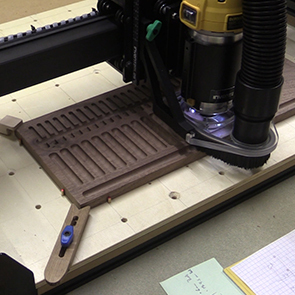 My X-Carve is mounted in a purpose-built enclosure with a pair of drawers for the various CNC bits and pieces. I wanted to keep the drawers tidy and so this simple project provides a means of organising and presenting my various CNC cutters." "The organiser is a simple slab of walnut (but any wood could be used) which precisely fits the width of one of my drawers. I used a piece of walnut which had been left over from a project some time ago. I buy much of my material from a company called Timbersource who specialise in small orders placed through their web site and delivered within 3 working days by courier." "Using VCarve Pro I was able to design the layout, size and depth of the recesses needed to accommodate each of the cutters. The design process and toolpath creation took about 25 minutes and I have produced a video of the complete process. The work was completed using Universal G-Code Sender (UGCS) to relay the toolpath information and control the cutting on the CNC." "I used just 2 cutters, both ball nose, one with a 9.5 mm diameter and the other with a 6.35 mm diameter. VCarve Pro managed the cutting parameters for me. I really like the simplicity of the design environment and the ability to immediately create toolpaths and see a 3D representation of them before committing the work to the CNC. What particularly helped me was the new array copy toolpath feature in VCarve Pro, this gave me the ability to create an array of elements in which saved a lot of time in the design stage." Peter started on his quest to educate the world 6 years ago and along the way has continued to learn and grow himself. It's great to see that Peter views his CNC machine and VCarve Pro software as valued tools in his arsenal just like his traditional hand tools. Peter has kindly enabled us to share the project files with our community for FREE. We would like to thank Peter for taking the time out of his busy schedule to share his story, project and knowledge with us. To download the free project files login to your V&CO account below.